Coral reefs serve as incubators for biodiversity and coastline buffers against erosion from violent storms. They also provide resources for food and life-saving drugs. Their economic value to the world’s population stretches into the hundreds of billions of dollars. For all these benefits, sadly, many of the biggest reefs from Australia to South America are decaying. Why are coral reefs dying? The reasons are multi-fold but they also point to steps necessary for reversal. Before discussions of ozone and greenhouse gasses, there was pollution. From chemical runoff to plain old litter, pollution degrades the environment. Many people like to live in coastal regions, as population studies demonstrate. With more people residing nearby, coral reefs experience the stress. Petroleum run-off and agricultural pesticides degrade the water. Sediment from tree removal and sewage outflows both reduce the capacity of coral to thrive. Debris from ships and other vessels do likewise. The oceans are rife with non-biodegradable plastic, rubber tires, forgotten fishing nets and glass bottles. Each of these kills or inhibits the breeding of reef species. The Hawaiian coral reefs experience many of these problems. Why are coral reefs dying? Pollution is one cause. Whereas most undersea ecosystems foster plant growth, coral dominates certain regions because optimal conditions inhibit algae. The alga is a non flowering plant, like seaweed, that conducts photosynthesis. While such organisms are beneficial to plant life, they can restrict needed oxygen for coral and repress beneficial bacteria. According to researchers, this can reduce coral generation up to 37 percent. Much of this reduction relates to overfishing. This practice eliminates fish and other species that feed on algae, keeping the plants’ presence at a non-threatening level. Fortunately, technology exists to extract algae near the reefs with machines. Nevertheless, long-term health is preserved only through dialing back the fishing. One of the primary species that feast on algae is the diadema antillarum, or the black sea urchin. Over 30 years ago, however, the urchins started to die off, especially in the Caribbean reefs and elsewhere in the south Atlantic. The disease is still mysterious to marine epidemiologists but its symptoms are consistent: loss of pigment, build-up of sediment, spinal deterioration and loss of substrates (the spindle projections common among urchins). They destroy homes, flood streets and cause power outages. Yet few really know what hurricanes do sub-aquatic habitats. In certain respects, tropical storms are good for coral reefs in that they extract heat from the water and inject it into the atmosphere, sparing coral from heat stress. At the same time, however, too much rain can explain reef damage in terms of salinity. According to a European Commission agency on science education, the best range for salt solubility is between 32 and 40 PSUs (practical salinity units). Too much freshwater infused too quickly is detrimental to coral survival. Hurricanes, typhoons and tropical depressions form a piece of the puzzle as to why are coral reefs dying. If hurricanes can benefit coral by lowering the temperature of the water, it stands to reason that coral reefs have a limit to the heat they can absorb. Although they flourish in tropical zones, these ridges tend to lose health when the water exceeds 84˚F. This is especially true over long periods of time. A particularly striking example of this is the Great Barrier Reef off the Australian coast. While many algae threaten the life of coral, zooxanthellae are indispensible to its vitality. In fact, these organisms are its primary source of nutrition and color. Zooxanthellae die off during extended warm spells, and with them the coral. 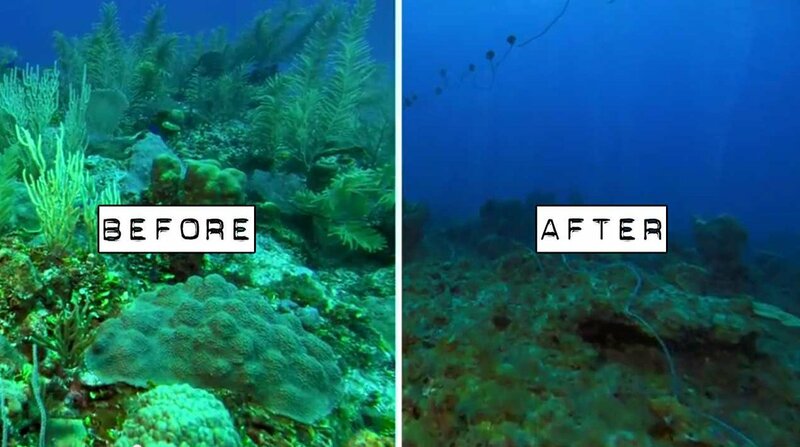 The loss of color – bleaching is the term – is the best evidence of coral death. At the section of reef off Cape York, Australia, divers determine that half of the coral is bleached. When the curious ask how does global warming affect the coral reefs, bleaching is a picture worth a thousand words. Among the several explanations regarding why are coral reefs dying, there is one that is simple—and easy to address. Coral is a popular component in bracelets, necklaces and even earrings. Given its popularity as jewelry, extracting it from its reefs is a profitable enterprise. Were it not for all of the other threats to these biologically rich habitats, wearing coral might not be so controversial. Yet the loss of such large amounts of the underwater polyps makes coral-based ornamentation a luxury the world might do without. Harvesting coral also diminishes its reproductive vigor. Coral shields species (like the black sea urchin) from overexposure to light. By contrast, coral requires an adequate amount of sunlight for robust health. Sediment eclipses that needed light and interrupts photosynthesis. Broken-down materials that make their way to sea can – as noted above – be the result of human activity on land. The deterioration of coral reefs is an immediate and serious threat to the balance of nature beneath the seas. Although it is unfair to say it is all the fault of humanity, it is irrational to believe the geophysics of the earth and the climate of the atmosphere will change to accommodate us. Therefore, people are wise to practice sustainable living and reduce their impact on the natural world.